Are you traveling with your pooch this summer? If the answer is "yes," you might think you have it in the bag. Your pup's pretty even-tempered and a total angel around strangers. Plus, you couldn't imagine not bring your dog along with you on your trip. Drop him/her off at doggie daycare? No, thanks. But regardless of your pup's temperament, flying with dogs and other pet animals should actually be your last resort — at least, according to Kitty Block, CEO of the Humane Society of the United States. "If you have to fly [...] don't take your animal unless obviously there aren't any options," Block told CNN. "It's not an ideal situation for an animal, and it can be stressful for the animal." However, dog behaviorist Cesar Millan disagrees. "I travel with my dog everywhere," he told CNN in 2012. "It's the right thing to do. In Mexico, we went to the market — dogs follow. Went to school — dogs follow." If it does come down to having your pet come along for the plane ride, your first step — according to Block — is taking your pet to the vet to get its health checked and its immunizations up-to-date to ensure it's flight-ready. 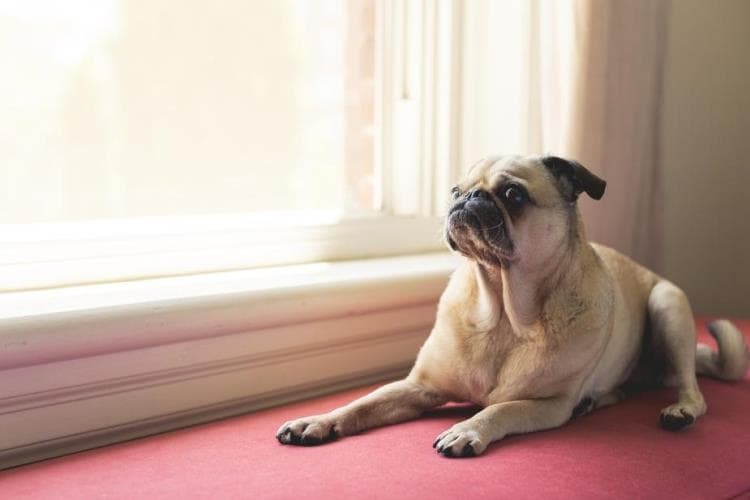 It's also important to note if your dog suffers from anxiety; if it does, the folks at Travelocity suggest consulting your vet (which you can do during your check-up) and asking if air travel is even a safe option for your dog. Then, once that's said and done, it's time to research into each airline's specific pet policy — because it's highly advised to check policies before you book. Three things to look into include: a) if your airline allows pets in the cabin, b) if the airline has weight and/or breed restrictions, and c) how much money you're expected to pay to have Fido fly with you. Regarding weight restrictions, note that typically dogs around 15 pounds or less can fit comfortably in airline-approved pet carriers, according to Barkpost. Though airline requirements vary, typically approved carriers are between 16 and 19 inches long (or less) and about 10 inches tall. Also important to note regarding carriers? Get your pooch acquainted with it and as comfortable as possible traveling in one. Try not to wait until the day of the flight to wrangle your dog into the carrier; you'll likely end up spending more time getting your dog in and could make you late for your flight. "Don't just put them in a crate the day before. It should be a transition," says Millan. "You have to teach your dog to hold its bladder — it's almost like training for a marathon. "Go through the process before you fly,” he continues. “For example, flying from Los Angeles to Spain is 14 hours. So I conditioned Julio and rest of my dogs to gradually be able to wait two, four, six, eight hours." All that said — and to make things easier on you — we've listed several airlines below and their respective pet policies. One tip: Once you've settled on an airline, call them! Get the rules and their policy over the phone and book your flight reservation early — many airlines allow only a certain number of in-cabin pets per flight. ●	Maximum weight: No limit, but your pet must fit comfortably in the carrier under your seat. ●	Age and maximum weight: Dogs must be at least 8 weeks of age, and no more than 20 pounds, including carrier. They must also fit under the seat in front of you the entire flight. ●	Maximum weight: 22 pounds including carrier; your pet must fit comfortably in the carrier under the seat in front of you. ●	Type of dog and maximum weight: Guide dogs are allowed, regardless of weight; max weight for all others: 17 pounds, including transport bag. ○	Important to note: As of November 2017, crates are no longer allowed in the cabin. ●	Cost: $153.56 for flights departing from the U.S.
●	International? : Yes, but the airline does not accept pets in the business cabin on intercontinental flights — they must travel in the hold. After a temporary hold on reservations in March 2018, United announced it will allow reservations beginning June 18, 2018 for pets traveling on the same flight as their pet parent or guardian beginning July 9, 2018. For pets traveling alone, United will allow reservations beginning July 16, 2018 for travel beginning July 30, 2018. Also, effective April 24, 2018, all customers traveling with in-cabin pets must check in with a United customer service representative in the airport lobby to receive a yellow bag tag to attach to their pet's kennel. ●	Type of dogs and maximum weight: No limit, but must fit comfortably in carrier under seat; there are several restrictions on breeds, so please visit United's website for the full list. ●	Cost: $125 each way with an additional $125 service charge for each stopover of more than four hours within the U.S.
●	International? : Rules for international in-cabin pets vary — contact the United customer-contact center for info. ●	Maximum weight: No limit, but pet must fit comfortably in carrier the seat. ●	Maximum weight: 20 pounds with carrier; the carrier cannot exceed the following dimensions: 17 inches long x 12.5 inches wide x 8 inches high. ●	Types of dogs allowed and maximum weight: Dogs must be at least 8 weeks old and weaned; max weight: 20 pounds, including carrier. ●	International? : Yes, to and from Mexico with proper vet documentation. Once you've booked your flight and you are familiar with the rules, one last step before you head to the airport the day of your flight: Bring a copy of your dog's vaccines — just in case. You never know if the airline will want to see proof of vaccination. Bon voyage and safe travels to you and your pooch! Kristine Cannon is a professional writer and editor. You can find her work on Canadian Pharmacy online, SheKnows, Taste Company, Alternative Press, Scottsdale Living, AZRE Magazine, AZ Business Magazine and Experience AZ.